Liu Wen Hua was the son of the famous Xing Yi Boxer, Liu Qi Lan. Liu Wen Hua’s book, A Detailed Collection of Xing Yi Quan Skills, is a gem. More than a mere how-to manual showing posture and form, the book gives practical descriptions on the internal actions and feelings inherent in the physical movements. This first excerpt begins Liu’s discussion of the 12 Animals of Xing Yi Quan. The dragon is most skillful of all animals in extending (expansion) and retracting (contraction) and in its undetectable changes and transformations. It is said: the dragon possesses the method of gathering in (contracting) the bones. If we desire to imitate its shape to win victory, the tendons and bones of the entire body will benefit. Therefore, in training the dragon style, one can perceive the strength in the crouching body posture and especially the strength exerted by the knees. Rising up relies on the waist. If there is not vertical (erecting) strength in the waist, it is not possible to expand and contract (extend and retract), change and transform or use whole body power. Starting from the splitting fist, clench the two hands into fists and then pull the left hand backward to drill upward in front of the heart. At the same time, uplift the left leg to shrink the whole body, crouching downward to the left side, with the right hand and left foot turning outward in a twisting action facing forward. Then, drill upward, with the right hand stretching and opening the whole body upward, and then immediately shrink the body downward to the right side, with the right foot and left hand turning outward in a twisting action. In this way, one [action] is continually linked to the next. The tiger’s pouncing power is most powerful. It is irresistibly fierce and unstoppable. When training the tiger form, in order to be capable of pouncing forward powerfully, all depends on the buttocks (and hips). The buttocks uplift the strength of the lower body, sending it upward and forward, transmitting the strength of the whole body from the back up to the brain. From the brain it pours downward to pounce. If one does not understand the buttock power, one cannot train this method. In training this method, start with the splitting fist and move the right hand forward to connect with the left hand. Clench the two hands into fists and then immediately to pull them back to the rib side, and walk forward with a quick step. It is said: that the tiger is powerful and brave in pouncing on its prey. As the two hands drill upward, drop the shoulders and raise the hands forward at the level of the mouth before the palms issue outward and drop, moving in coordination with the left foot. Then the left foot inch steps and both hands pull back to the rib side. The right foot steps forward and he two hands drill upward to release the palms downward in coordination with the right foot. In this way left and right sides are continuously linked and unbroken. The monkey lives in mountain forests. Climbing and jumping are its special skills. Therefore when practicing the monkey form, there must be nimble and agile shen fa  in jumping and leaping. It is said: that the monkey is jumps and leaps up the mountain. The right hand extends and the left leg lifts; the left hand extends and the right leg lifts. When striking, there must be strength in the knee. In training this method, start with the splitting fist. The left hand drills upward and the left foot steps out with an inch step. The right foot goes inward and forward. If the left foot retreats, the right foot also retreats. The right and left hands follow the retreating steps with splitting fists. The whole body contracts (shrinks) into a small posture, and the whole body stretches (unfolds) to leap up. The left leg lifts and the right hand extends outward to the level of the nose. The left hand goes out over the right hand to split in coordination with the left foot. Then turn the body around. The training method is same for both the left and right sides. In this style the neck erects, the teeth knock,  the eyes are sharp and spirited, and leaping and jumping must be agile and nimble. Literally: “body method.” The body actions or methods (both internal and external), of maneuvering the body in self-defense. The monkey is said to have an agile body and a nimble mind. Therefore it is spontaneous, watchful and opportunistic. It is said that the horse form is characterized by hoof power [galloping]. When the horse gallops, the rear hooves pass in front of the front hooves. In the martial arts, this ability is imitated. When training the horse style, one must press  down with the rear foot in order to walk forward with the front foot and then forcefully step and press  forward with the rear foot. This is called the quickstep. In training, start with the splitting fist. Clench both hands into fists and walk forward with the left foot first. The right foot follows quickly. Simultaneously lift the left foot to the level of the shin bone of the right leg. As [the body suddenly] stops, the right hand bursts (beng) outward, while the left hand withdraws to the side of the right wrist. Then the left foot goes forward, striking with the bursting fist in accordance with the posture. Then the right foot and right hand form the gathering fist posture. The left and right movements are trained in the same way and are continuously linked and unbroken. 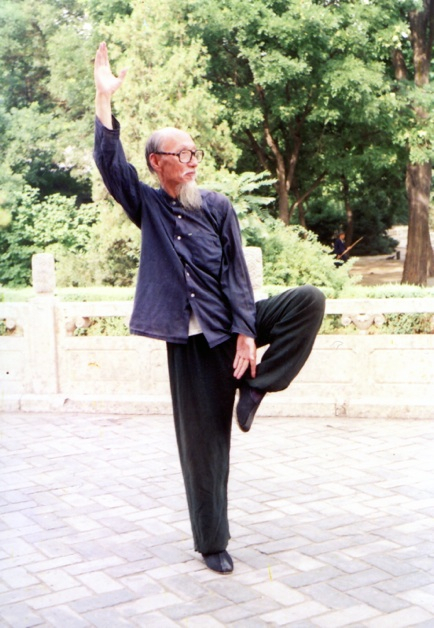 蹬 Deng, can mean “to pedal” or “press down” with the foot. Tuo Xing  is like the guard of the palace, and is similar to the alligator. It is said: that Tuo possesses the skill of floating/swimming in water; it is like a fish that swims/floats. It can be seen that the striking method of the alligator is with the elbow. Therefore, it is most important to use the strength of the elbow. It is said: that the elbow is also a “fist”. In training this method, start with the splitting fist. The thumb and forefinger stretch open, the other [fingers] roll and grasp. Drill upward with the left hand close to the body and shake the upper arm and kua, moving and leftward diagonally and forward. The left palm center faces outward and the right foot follows lifting to the level of the left shin bone. This is immediately followed by the right hand drilling upward close to the body as the right foot steps forward to the right followed by the left foot which lifts to the level of the right shin bone. The Shen Fa is the same. In this way the left and right sides are trained and are continuously linked and unbroken. 鮀 Tuo, literally means a “snake-fish”, hence this animal is sometimes called a “water-lizard” or “water-dragon.” In some styles of Xing Yi it is called the turtle style. However most boxers agree that it is probably an alligator or crocodile. In training this method, start with the splitting fist. Extend the right hand and draw the left hand back under the ribs as you step the left foot forward in an inch step. The right foot quickly goes forward and then stands still as you levelly lift the left foot. Simultaneously extend the left hand and withdraw the right hand. Advance the left foot forward, dropping down the right hand and right foot to strike out with Splitting Fist. Then, extend the left hand and draw the right hand back under the ribs as you step the right foot forward in an inch step. The left foot quickly goes forward and then stand still and levelly lift the right foot. Simultaneously extend the right hand and withdraw the left hand. Step the right foot forward, dropping down the left hand and left foot to strike out with Splitting Fist. In this way the left and right sides are trained and are continuously linked and unbroken. a gap, a crack, or an unoccupied space.